Historical newspaper articles for Otoe County, Nebraska are now available online – this is a gold mine for researching Dale’s Kreifels side of the family! 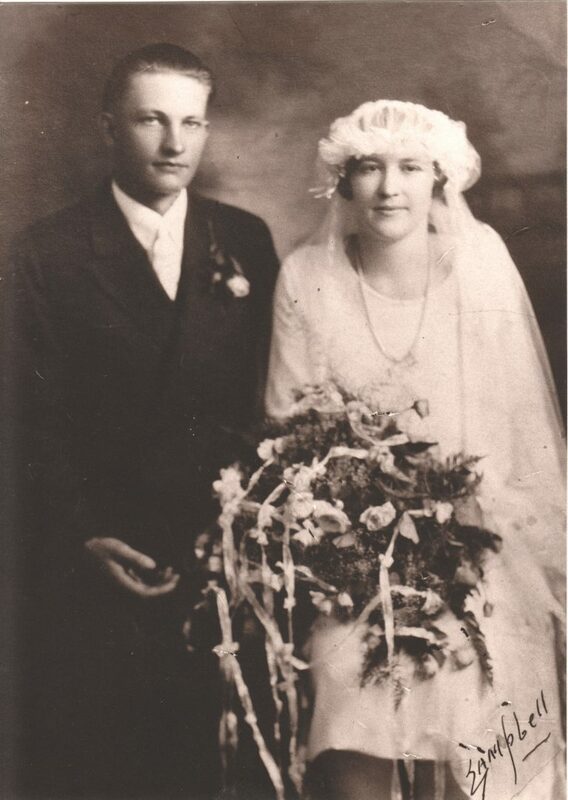 The marriage of Miss Elizabeth H. Kreifels, daughter of Mr. and Mrs. Louis Kreifels of near Paul, and Theodore J. Rademacher of Longmont, Col., took place Wednesday morning at 9 o’clock at St. Joseph’s Catholic church. The wedding was one of the largest and most impressive to take place there for some time. Solemn high mass was celebrated by Rev. C. F. Broermann, pastor of the church and assisting him were Rev. Rudolph Stoltz and Rev. I. C. Weis as deacon and sub-deacon. The church auditorium was entirely filled with relatives and friends of the young people. The bride wore a gown of white satin and carried a bouquet of bride’s roses. Her veil was held in place by a wreath of orange blossoms. Attending here were Miss Mary Bordenlager of Valley, Neb., and Miss Mary Pfeiffer of Fort Crook. The bridesmaids wore orange and green georgette gowns and carried bouquets. 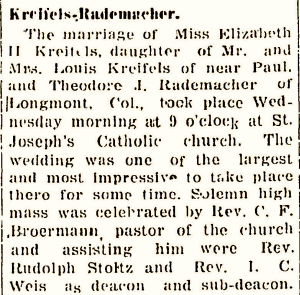 Joseph Ortman of Omaha and Edward Rademacher attended the bridegroom. Clement Kreifels, nephew of the bride, carried the ring and little Miss Constance Francois served as flower girl. The church choir sang Leonard’s mass and Mrs. William Rabhon presided at the organ. The bride was educated in St. Joseph’s schools and for the last few years has been assisting her mother with household duties. Mr. Rademacher is a prosperous young farmer. He is a son of Mr. and Mrs. Joseph Rademacher. After a short motor trip the young people will live at Longmont. Nebraska News Daily Press, September 15, 1927, page 5. The couple’s choice of attendants is really interesting and sheds light on some family dynamics. Elizabeth Kreifel’s biological mother, Josephine Ortman Kreifels, died in 1908 when Elizabeth was only six years old. (The mother mentioned in the news article was actually Elizabeth’s step-mother, Hattie Burkey Kreifels.) This is one of the most tragic stories in Dale’s family history. At the time of her death, Josephine was 37 years old and the mother of eight children. Her youngest was only one month old. The cause of death was suicide; she drank carbolic acid. It was the the middle of winter; we can only speculate but a deep post-partum depression would seem like a likely explanation. The relationship between the Kreifels and Ortman families were deeply strained after Josephine’s death with blame and bitterness going both directions. In spite of the strain, it seems the families continued to try to work together. The one-month old motherless baby, Josephine (known later in life as Sister Teresa), was sent to live with her aunt Mary Ortman Bortenlanger for a year. Aunt Mary Bortenlanger was Josephine’s youngest sister and was likely nursing a child at the time herself. That child could have been Mary Bortenlanger, one of the wedding attendants. Another of Josephine’s younger sisters, Elizabeth Ortman, had lived with Louis and Josephine for a while when she was a school teacher near Paul, Nebraska. Elizabeth met and married Wenz Pfeiffer. Their oldest daughter was Mary Pfeiffer – the other attendant at the wedding. She and Elizabeth (Kreifels) (sorry, lots of Mary’s and Elizabeth’s in this story) were first cousins and childhood friends. Dale and I had the pleasure of meeting Mary Pfeiffer Dunn in Omaha in 1995. She was 90 years old at the time and was still driving a car, gardening, baking, and keeping her own house on four acres. Ted’s attendants were Joseph Ortman and Edward Rademacher. Joseph Ortman was another of Elizabeth’s first cousins. Joseph was the son of Josephine’s brother Edward Anton Ortman. 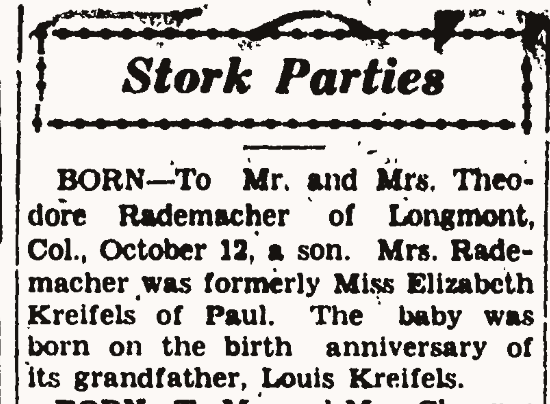 Edward Rademacher was Ted’s first cousin; Edward was the son of Peter Rademacher. So three of the four attendants were Ortman first cousins! 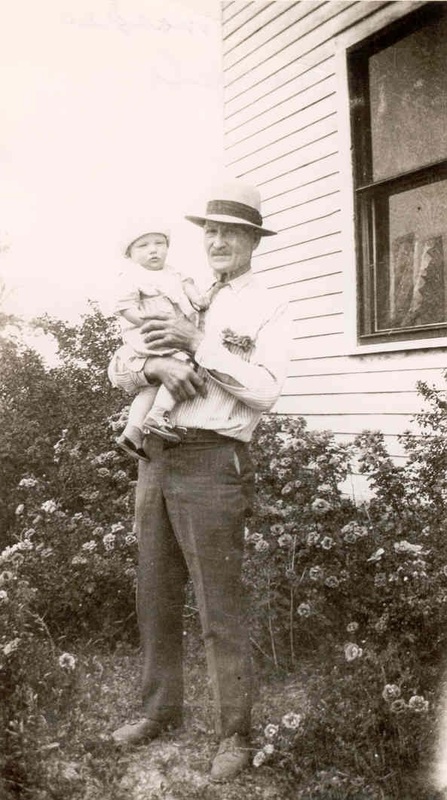 This would be, of course, the birth announcement for Dale’s father – who, although not mentioned in the announcement, was named after his grandfather Louis since they shared a birthday. Louis was lifelong friends with his first cousin Clem Kreifels, the ringbearer at his parents’ wedding. I’m looking forward to more digging in the Otoe County newspaper collection! Thank you for this information–I am going to update my family tree. I had been in touch with Evelyn Perez who was daughter of Tony Kreifels who was son of Hattie & Louis. I will have to let her know about all this also grand daughter of Ted & Eliz—hope I have that right–I am now on the down hill and my memory is getting very bad. Bobby Rademacher(Ted’s son) in high school looked like Uncle Ted’s twin in the wedding picture. I didn’t notice the resemblance back in the 60’s when I knew them. Nice write up. You should write a book or books with all the information you have gathered. Thank you ever so much for this posting of my mom and dad !! !